this app is a sort of manual stadium server type thing. and just before a match you alt-tab out of the game and select the home team from a dropdown list and the corresponding stadium that you wish to use from the list of stadiums and press replace. 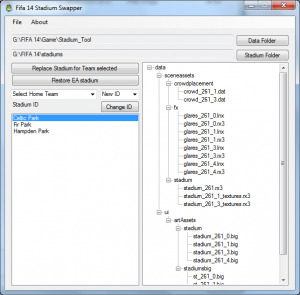 this copies the files from the stadiums folder to the data folder and renames them to the correct id for that team. this means that there is no need to add more stadiums to the game, which cuts out chances of error ie shadows at night time etc…. the only error i can see from this is the crowd shadow error where the stadium your replacing is smaller than the new stadium. to do this you highlight the home team in question then select the new id from the the dropdown box and press change ID, this rewrites the ini file with the new id for that team. and here is the link for jenkeys file loader. i hope ive explained how to use the app well enough if not let me know and ill try to explain it a bit better. if only there was some way to hook into the exe and make this automatic, that would be IDEAL!